This event will have a reserved seated Orchestra, Loge, and Balcony. It’s easy to forget sometimes. Like when you are looking out across a riot of 20,000 smiles at the Hollywood Bowl, with a 40 piece orchestra exploding behind you. Like when someone asks you, very politely, if you could just do that 16 second piece of score for the animated cat; again please? Or even when you’re melting in humid Havana, translating an alien musical language with some cool Cuban compadres. Keep it simple. Strip it back. Remember where you came from. These words kept coming back to Rodrigo Sanchez and Gabriela Quintero, from their humble roots busking in Dublin, playing Metallica bossa nova style in hotel bars for their own amusement; before they became one of the biggest selling acoustic instrumental acts in the world. After finishing the successful “Area 52” album in Cuba, and taking it on the road with Cuban musicians, Rodrigo y Gabriela decided to downsize. After all, it’s a short step from tour to entourage, so go back to basics, rediscover the joy of playing face to face, guitar versus guitar, rhythm and melody. Gabriela: “My idea was to record it as if we were to playing a live gig in your living room”. 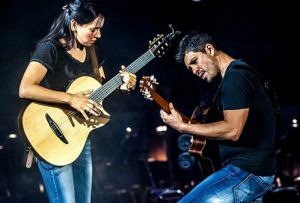 First and foremost, Rodrigo y Gabriela’s new album “9 Dead Alive” is a FEEL record. It’s closest relative in the RyG canon would be 2006’s self-titled break-out album. The playing is intuitive, the sound is intimate, the results are spectacular: bursting with melodic energy and rhythmic invention. Recorded at their Pacific Coast hideaway in late summer, the album captures the warmth and spontaneity of two great musicians riffing and jamming together; perfectly distilled into 9 new songs teeming with desire, elegance and gusto. Where does the inspiration for this luminous, unadulterated music come from? Remember where you come from, remember your gifts are slender compared to the sacrifices of others. Each of the songs on the album is a personal celebration of individuals who have passed on, but through their deeds and words still resonate in the 21st century. Going as far back as Eleanor of Acquitaine (1122 – 1204) to Viktor Frankl (1905 – 1997), and including a tribute to one of Rod & Gab’s enduring touchstones – animals and nature. The nonet celebrated in this diverse and fascinating list will strike a chord with anyone familiar with the duo’s passion for human rights, literature, history and philosophy. Rodrigo y Gabriela left Mexico at the end of the millennium. Since then they have played for presidents, toured the world many times over, written soundtracks for Hollywood block-busters, and sold over 1.5 million albums. “9 Dead Alive” sees them bring their timeless music all the way back home. From arena shows to bar gigs, and major label albums to indie releases, Marc Scibilia has done it all. A road warrior and genre jumping, singer/songwriter for more than a decade, he’s hand-built his audience the old-school way: by writing songs that count, playing shows that matter, and rolling with the punches. Born into a working-class family of Lebanese and Italian heritage in Buffalo, New York, Scibilia left town a month after graduating high school, moving away from the Northeast and resettling in East Nashville. His school guidance counselor had unknowingly set those wheels in motion several years earlier, when she sat down with Scibilia to talk about his future. Frustrated with his lack of conventional plans after graduation, she sarcastically asked him, “What are you going to do? Go to Nashville and write songs?” To the budding musician, that question sounded like a great idea, giving Scibilia the extra motivation he needed to head south. At 18 years old, he became one of the first members of his family — a family that includes several part-time musicians — to leave the Buffalo area. Nashville — a town rooted not only in country music, but pop, rock, and dance, too — has become an appropriate home base for Scibilia’s music. He doesn’t limit his songwriting to one genre. Instead, he writes songs that spread themselves wide, mixing pop hooks, rock & roll energy, and dark storytelling into the same pot. Taking cues from the artists he grew up with — including the Beastie Boys, Lauryn Hill, and Bob Dylan — he sings about the greatness of ordinary life, filling his songs with regular characters who resembled Scibilia, his family, and his friends. He tours heavily, too, opening for everyone from James Bay to the Zac Brown Band. Every night, the audiences are different but they all respond to Scibilia’s music. Eventually, his growing success earned him a record deal with Capitol/IRS Records. With Butch Walker serving as his producer, he recorded Out of Style, a major-label debut album whose title hinted at the music’s broad, multi-genre appeal. “I wanted it to feel like a mix-tape,” Scibilia explains, and he succeeded, creating an album that seemed poised to create just as much buzz as his cover of the Woody Guthrie song “This Land Is Your Land,” which had appeared in the most Shazam-ed commercial of Super Bowl 2015. Then, one week after the album’s release, the label closed and Scibilia was on his own once again. Fortunately, Scibilia had always thrived on independence. Wholly in charge of his career once again, he began making new music at his own studio, embracing the freedom to record and release songs whenever he wanted. There was nothing standing in his way: no boardroom meetings in Nashville skyscrapers, no focus groups, no record executives weighing in on his marketability. Even better, Scibilia’s fans were just as supportive as ever, turning his cover of John Lennon’s “Happy Xmas (War is Over)” — recorded as a duet with fellow songwriter and Nashville TV star Lennon Stella — into a viral smash. Released during the 2016 holiday season, the song racked up more than a million Spotify streams during the week before Christmas. Scibilia kicked off 2017 with another viral hit, “Summer Clothes,” a nostalgic single. “I was 18 when I moved from Buffalo to Nashville,” he reflects, “and my dad would call me once a week and end every conversation with, ‘One more time, what’s your address?’ But he would never send me any mail. The song is a little bit about my hometown, my family, but mostly just someone looking for an excuse to call someone they miss.” Scibilia released the song as a double-sided single: the first featuring synthesizers, acoustic guitars, and drum loops, and the second fueled by a stripped-down combination of vocals and unplugged guitars. Then, while the song gathered steam on the Spotify and iTunes charts, Scibilia did what he’s always done—continued writing and creating from his life experiences out on the road and at home in East Nashville.